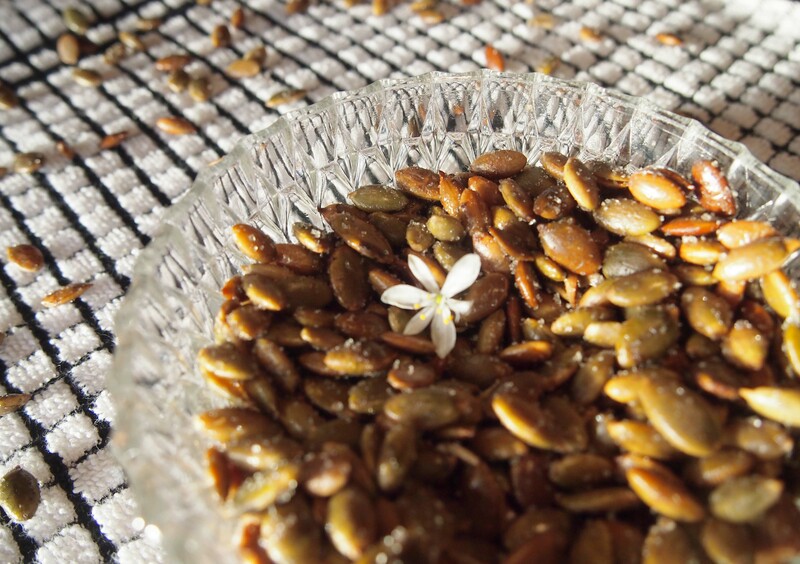 I’ve been munching on pumpkin seeds a lot lately as it’s an easy snack – but I wanted to get more flavour into them. After having a little think, I figured that the flavouring of the zucchini chips recipe would taste soo good on pumpkin seeds so I set about recipe testing. The first few batches didn’t work out too well – to be honest, they just kept burning. But after turning down the heat, and altering how long I left the seeds in the oven, I finally perfected the recipe and it was time to share it with all of you! This recipe is incredibly quick and easy, has only three ingredients (yay) and is completely addictive. It tastes like healthy popcorn. You can taste the salt in this one but I personally like it, just like I like the taste of salt in salt and vinegar chips, or salt on popcorn. Step 1: Preheat oven to 130°C and line tray with baking paper (you could use foil it wouldn’t matter for this recipe). 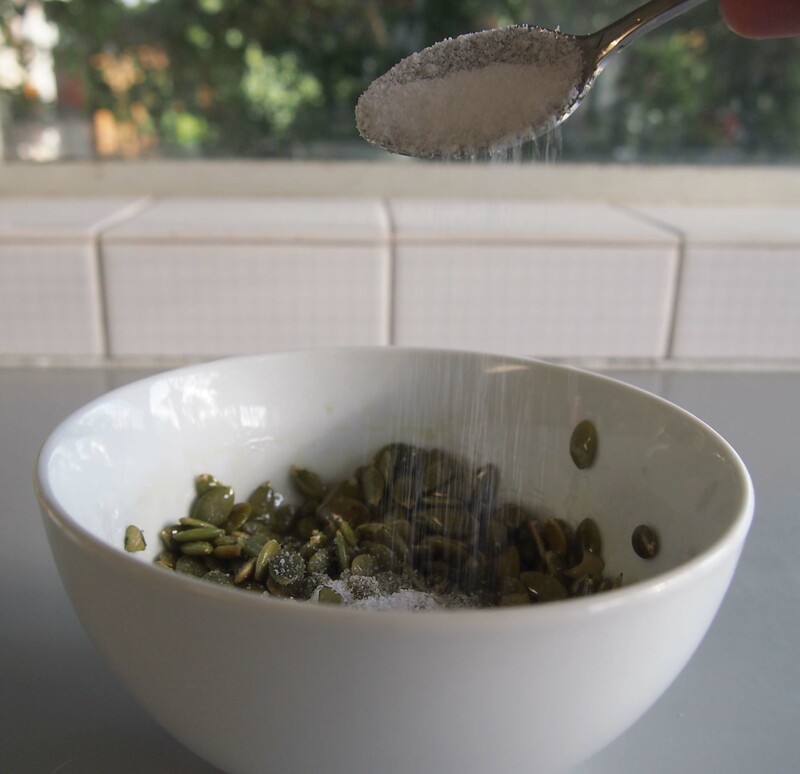 Step 2: Pour pumpkin seeds into a small bowl and spray oil into it for approximately 2 – 4 seconds. 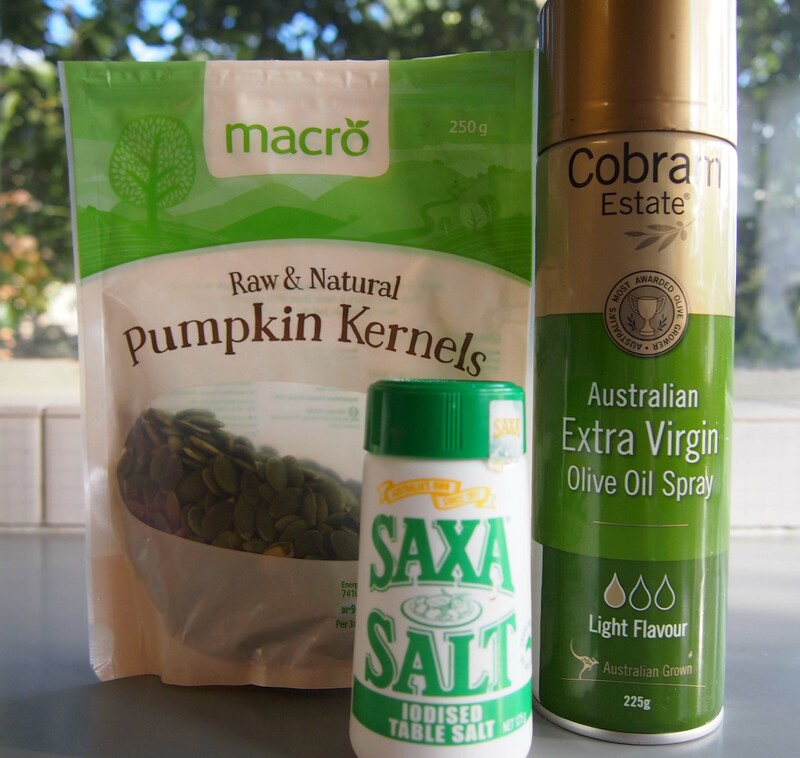 Then add the salt and thoroughly mix the oil and salt through the pumpkin seeds. Step 3: Spread the pumpkin seeds out onto the baking tray. 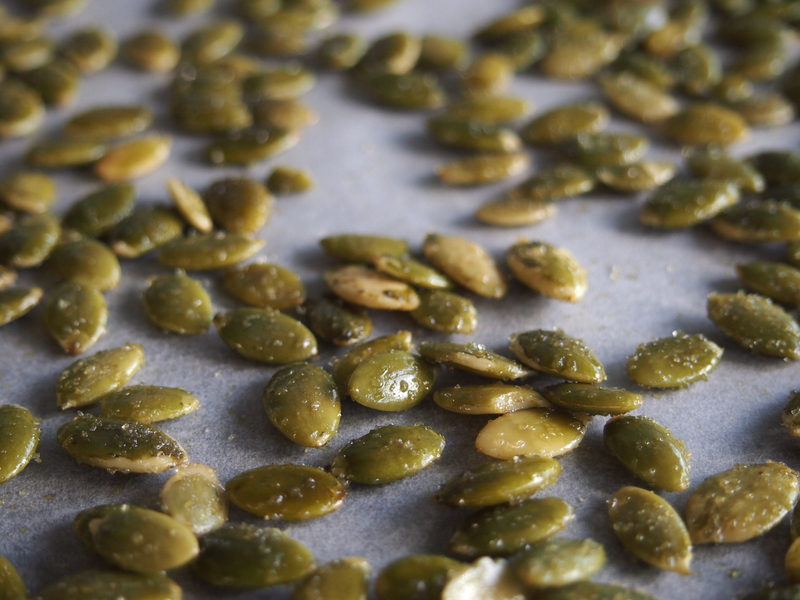 Try to make sure that the pumpkin seeds don’t overlap where possible to ensure an even ‘roasting’ of the seeds. Don’t worry if they overlap in some places! Place in the oven for approx. 7 minutes. 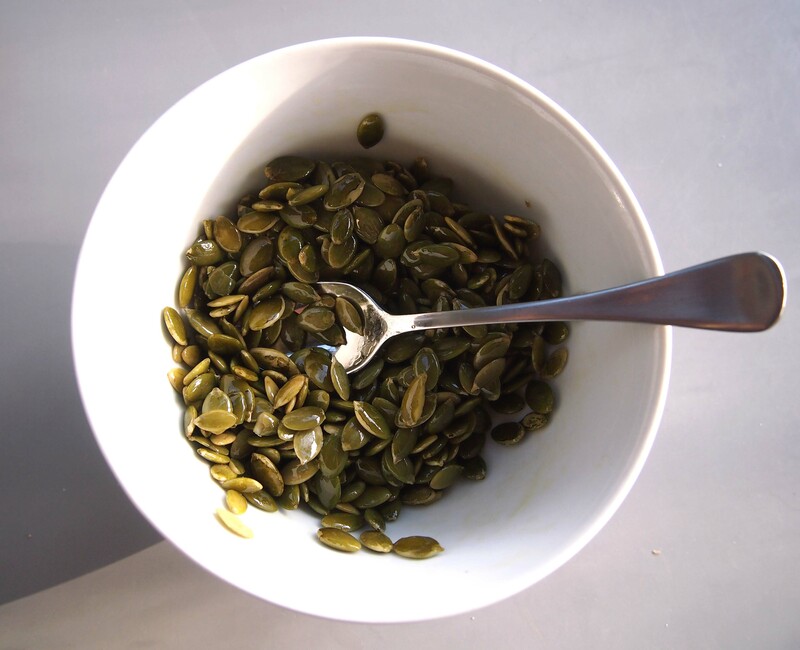 Step 4: Take the pumpkin seeds out of the oven and mix the seeds around and place back in the oven for another 5 – 7 minutes or until they are the crispiness you want. Remember to try to ensure the pumpkin seeds don’t overlap too much when you put them back on the tray to go into the oven. Step 5: Take the pumpkin seeds out of the oven and allow to cool down before eating. Eating these is like eating popcorn as there is a great crunch in every bite. Just like eating pumpkin seeds normally they tend to fill you up quite quickly and you do, well I do, tend to eat them, quite absent-mindedly until I suddenly realise that I am full. This is a very healthy snack. It is an incredibly easy one to make and is minimally time consuming to both prepare and cook which I really love about it. Also it has quite a lot of salt it in which is fantastic :). So glad to hear it! They have quickly become a favourite in my household! Those look yummy. I’m not much of a cook, so I especially admire people who stick with something till they get it right. Born To Organize, they are yummy and very simple (three ingredients). It has made me want to find more recipes with minimal ingredients! I’ve heard of recipe books chock full of simple ingredient recpices. They’re often the best. Maybe you can do a Google search and come up with some to add to your repertoire. Thanks for the idea. I’m always on the look out for simple recipes. That’s it. I’m snacking on some of these… perfect time for a health tip. Thanks for this. Haha these ones are really quick to make so you get fast satisfaction from the preparation to the eating stage which is great. Hope you enjoy them :).